The Query Plans tab lists all plans collected for Top SQL completed queries for the specified date range, and provides a detailed chronology of all completed query plan changes. Use Query Plans to look back at any point in time to see when a plan change led to a query performance problem. Note: The Query Plans tab does not currently display collected Top SQL Query Stats or Procedure Stats query plans. The Show Totals toolbar button controls whether the grid lists plans are grouped by stored procedure. 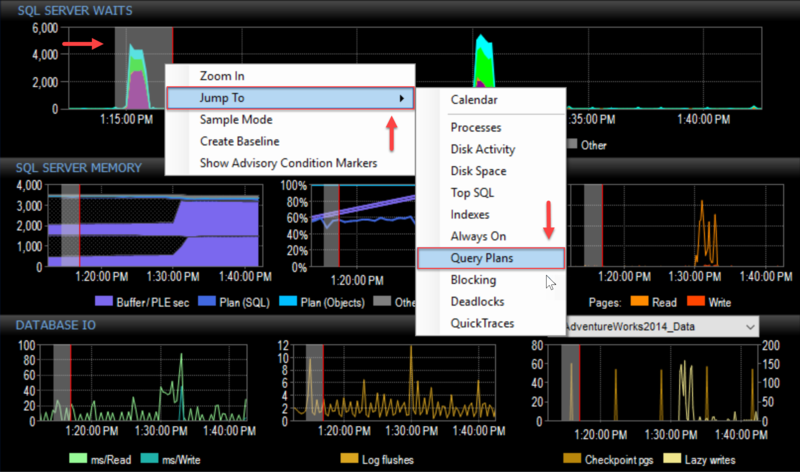 Jump To > Query Plans tab by highlighting a range on the dashboard as usual. For example, if you see a spike in parallelism waits on the SQL Server Waits chart, highlight the spike, and then select Jump To > Query Plans. Sort by the Parallel Operations column to determine which queries caused the spike. Highlight spike, then select Jump to > Query Plans. Sort by Parallel Operations in Query Plans. Note: The same approach can be used to find queries with key or RID lookups because Lookups are now displayed on the Dashboard, as well as other metrics that correlate, such as I/O and table/index scans. The Filter pane allows you to filter the Query Plans by SQL Server. The Bottom pane lists the records matching the current filters. There are two modes for this pane: Default and Totals. Default lists presents all events for the active date range in a standard list format, sorted in order by Database name, Object name, and Plan Creation Time (descending). Totals lists presents all events for the active date range in a standard list format, sorted in order by Database name, Object name, and Plan Creation Time (descending). After changing the filter, select Refresh , or press F5 to apply the filter. To open the plan in the Query Plan Analysis window, select the Open button under the Plan column. (If the Show Totals button is selected, you need to expand the Database Name to see the Plan column). Note: The context menu provides an option to Highlight recompiles in the current date range for a statement by enabling the checkbox.